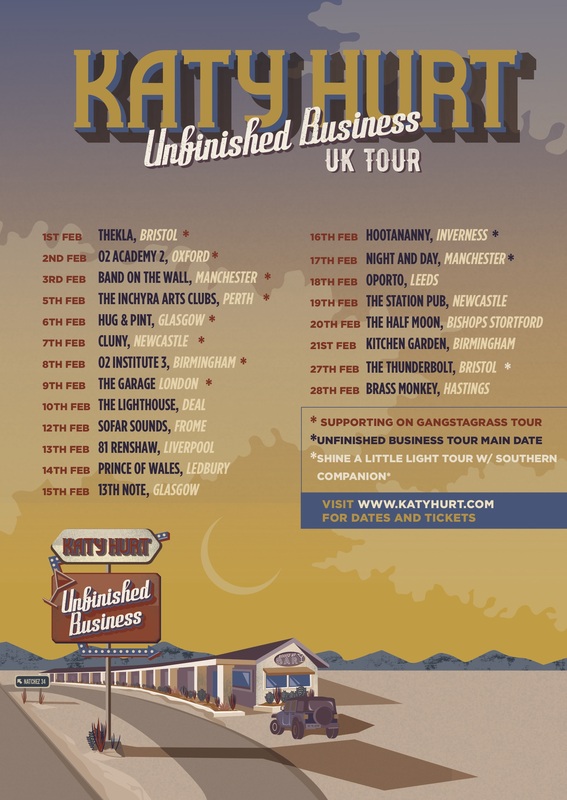 Katy Hurt has rapidly become a leading light on the UK Country/Americana scene and all without having released a full length studio album. 2018 has seen her nominated for “Best Country/Folk Act” at the Unsigned Music Awards as well as performing festival slots at Country 2 Country, BlackDeer, Rhythmtree, Cornbury and many more. Katy spent 2017 and 2018 performing at 100+ shows each year around the country since the launch of her EP “Pieces of Me” and highly praised singles from her upcoming EP “Unfinished Business, with songs impressing fans by combining the honest lyrical content of country with riffs and haunting vocals. BBC Radio 2’s Paul Sexton described Katy as “One of the most exciting prospects on the burgeoning country scene”, saying “Hurt’s distinctive EP is the latest evidence of a career that’s already produced an iTunes UK Country No. 1 in ‘Love You More, she’s a vivacious and magnetic performer…Check her out now whilst you can still get to the front row”. Katy’s performance at The Pilton Party, highly praised by Michael Eavis, introduced crowds to her latest singles displaying great crossover potential into the rock, pop and blues genres. “Truly a diverse artist”. Demi Marriner is a songwriter worth keeping track of. Her passion and emotion are so contagious, it is impossible to not be captivated from the offset. Whether she is pouring out her heart in intimate solo shows, or kicking down the doors with her backing band, Demi knows how to impress. The songstress has graced many a stage, including; the Symphony Hall supporting Rufus Wainwright, the Town Hall with Sam Outlaw, the Jazz Arena at Cheltenham Jazz Festival, Americanafest in Nashville, Countryfile Live at Blenheim Palace, and more. She has also supported artists like Jon Gomm, Tia McGraff, BJ Barham, Cattle & Cane, Wildwood Kin and Elles Bailey. Following the success of Demi’s first releases reaching the top 2 in the iTunes Country Album Charts, the physical release of her live EP, Tales, and an American songwriting trip, Demi is planning her debut album and is set for an exciting 2019.